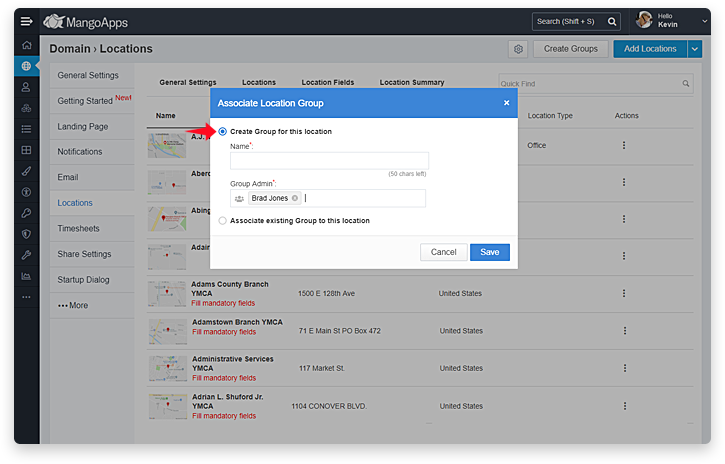 /Office Location /Company Intranet /Discussion Groups /How to Add Location Based Groups for Your Office Location? 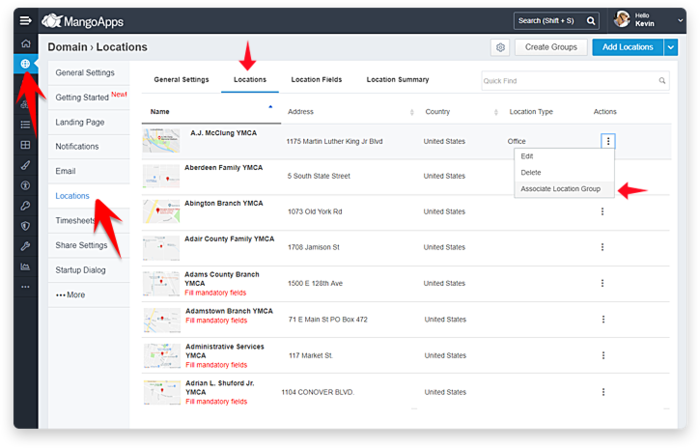 You can now create a location-based group for each of your office locations. With these location-based groups, the group membership is automatically managed for you. 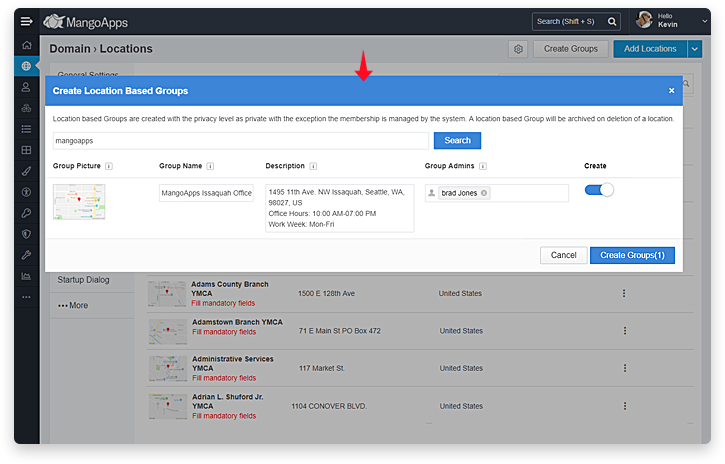 For example, if a user is assigned the office location as ‘Seattle’, he is automatically made part of the ‘Seattle Location Group’ and has access to all the pages, files, posts, wikis, events etc., in that group. 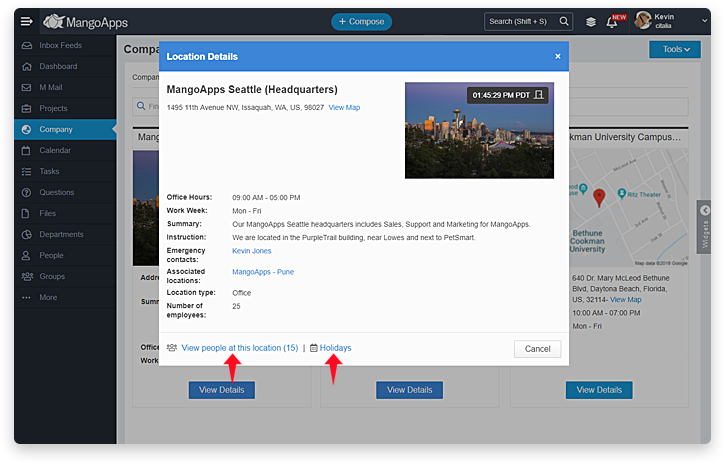 When the location of the user in future changes from ‘Seattle’ to say ‘Boston’, MangoApps automatically removes the user from ‘Seattle Location Group’ and adds them to ‘Boston Location Group’, now giving the user access to information he needs relevant to the office location in Boston. 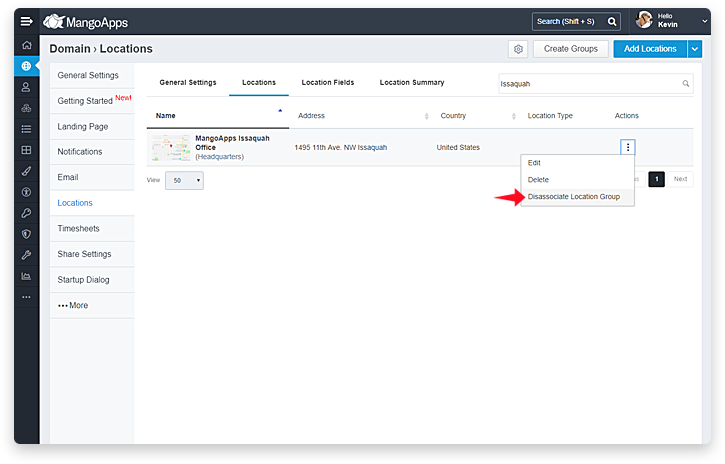 Kindly note, only Domain admins can create new location-based groups. Domain admins can also assign an existing group to a location. This automatically converts the regular group into a location-based group. With each location you can now optionally attach a ‘Office Floor Plan’. By default, all users in the company have a view only access to the office floor plan files and domain admins have owner privileges. 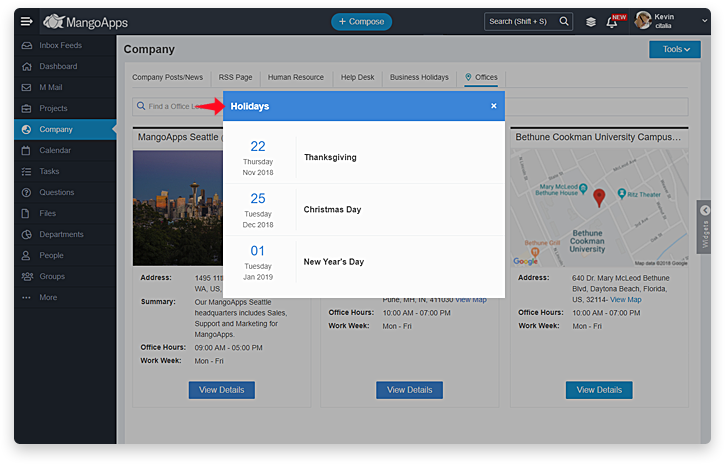 Also, the locations page in the company module that lists all your office locations now gives you a quick way to see the ‘holidays’ and ‘people’ at each location. 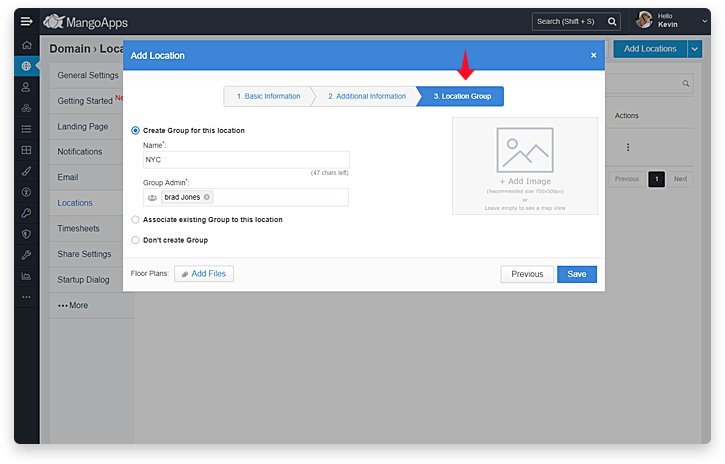 2) Here Under ‘Location Groups’, you can choose to create a new Location group and assign its admin or you can select an existing group to be the location group. 1) Go to ‘Domain’> ‘Locations’. 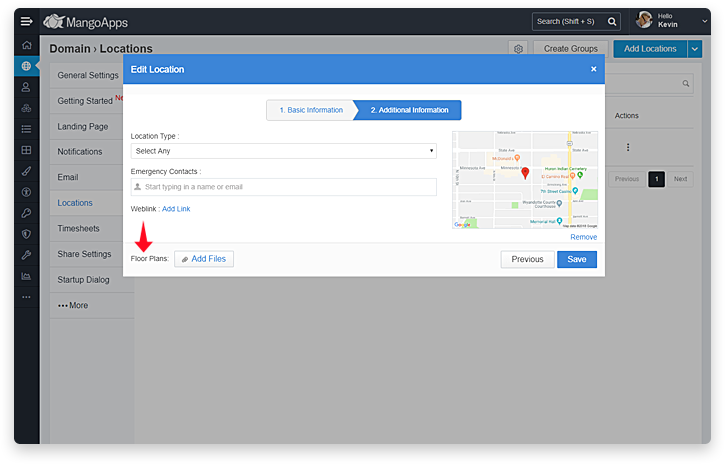 3) Here you can choose to create a new Location group and assign its admin or you can select an existing group to be the location group. 1) Go to ‘Domain’> ‘ Locations’. 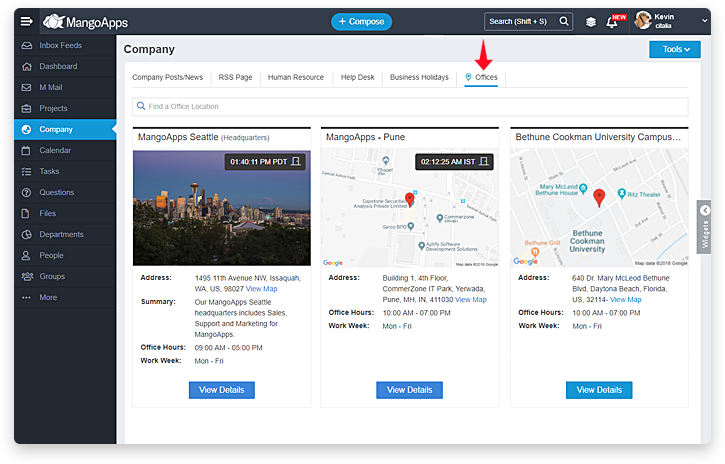 Users can then access these Office Locations from Company Pages > Offices. They will be able to see location details, current time at the location, emergency contact person and other details associated with that location. Users will also be able to view their colleagues working and holidays associated with that location.